The Pebble Smartwatch has been around for years, and the introduction of the Apple Watch has everyone looking at wrist-mounted computing as the newest gadget consumers can glom onto. There was never any doubt the 2015 Hackaday Prize would have more than a few smartwatches. [Ramon]’s Zerowatch gets its name from the Arduino Zero, as this watch is based off of and completely compatible with the Arduino Zero. With a 48 MHz ARM Cortex M0+, a three-axis accelrometer, a microSD card slot, and a bright OLED display, this is an extremely capable wrist-mounted computer. As with all wearable electronics, the enclosure makes or breaks the entire device, and [Ramon] has a very slick 3D printed case for this watch. Connectivity is important for smartwatches, and that’s something [Montassar]’s Open Source Smart Watch doesn’t skimp out on. He’s using an STM32F4 as the main controller and a 1.44″ TFT, and adding the standard Bluetooth module — an HC-05 — to the mix. [Montasar]’s project is also tackling connectivity by working on a few Android apps that connect directly to this phone. He’s using the MIT App Inventor to speed up development for these phone apps, and makes custom smartwatch apps a breeze. Both are great projects, and thanks to free, open source, and easy to use tool chains, both projects are excellent examples of open hardware development and a great entry to The Hackaday Prize. Since [th3badwolf] realized a wrist watch is the ultimate men’s fashion accessory, he’s been trolling around eBay looking for a nice looking, but still inexpensive wearable chronometer. The Fauxlex brand isn’t normally regarded for accurate time keeping, so he decided measure the accuracy of his off-brand watches in a really clever way. [th3badwolf] had a camera with a built-in intervalometer lying around and figured if the camera was set to take one picture a minute, the second hand would stay still while the minute and hour hands moved. An hour-long test confirmed his theory and he pointed his cameras towards his knock-off watches. 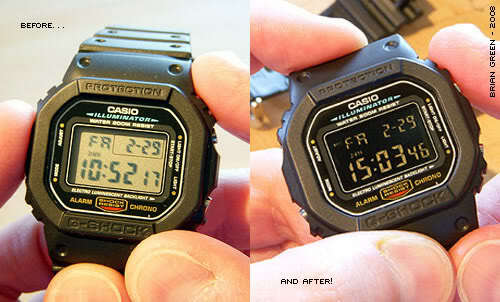 In the resulting time-lapse video available after the break, [th3badwolf] calculated that the first and third watches lose about 24 seconds a day. He attributes this fact to the watches having the same clockworks. The second watch gains nearly three minutes a day, and he’s trying to send that one back to the supplier. We’re not sure how that will end up, but at least [th3badwolf] has two reasonably accurate watches now.